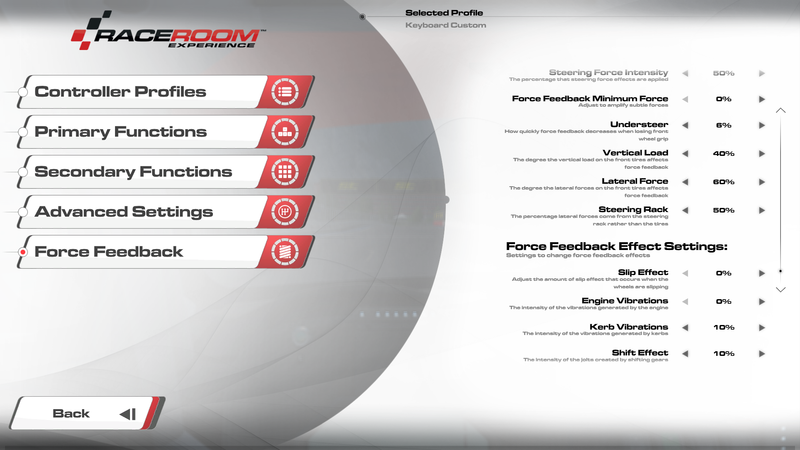 RaceRoom Racing Experience Force Feedback Settings – Selah. Update 2016-12-10 (2): Important! 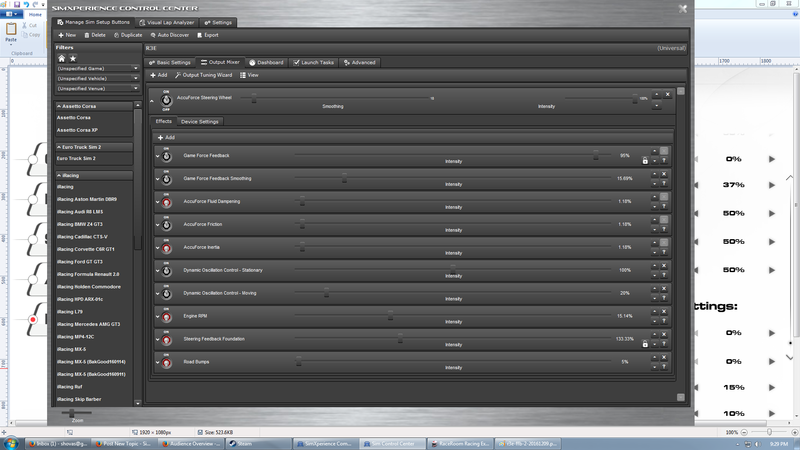 Be sure you are basing your R3E Controller Profile tweaking on the correct device: The AccuForce Controller Profile. 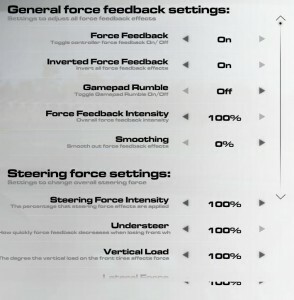 I was under the impression that, if the game knew about the AccuForce, and I setup the default in-game Controller Profile with the AccuForce wheel and buttons, that I was doing the right thing: Not so, it was using a lot of behind-the-scenes defaults for the actual selected device – the keyboard! So, be sure the first thing you do when setting up R3E is to actually click the AccuForce Controller Profile button in-game. It can be confusing as it doesn’t look like a button and it doesn’t highlight in a clear and obvious way. If you don’t do this you’ll end up reverse engineering the AccuForce Controller Profile, as I did, and you still won’t end up with a good result due to all the hidden logic they’ve already worked on themselves (including degrees of rotation support missing if you select keyboard). Update 2016-01-12: Renamed Wishlist to Suggestions for Improvements and added a number of items. Update 2015-09-25: I’ve been putting a lot of my AccuForce updates for R3E in my AccuForce post over here. Update 2015-06-04: Check out this post by Georg Ortner of S3 that explains the different FFB options. 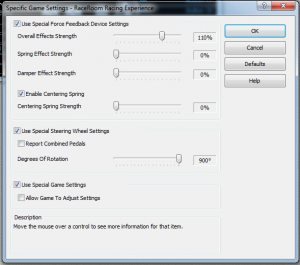 Update 2015-04-15: Georg Ortner, dev for Sector 3, has posted his G27 Logitech Profiler and in-game settings (link fixed 2015-04-16 as they deleted the old one ugh) on the S3 forums. Ugh. Okay they deleted that thead. It’s still a good thread for getting an idea of what other people are doing, however. Here’s the gist: He has disabled Spring Effect, Damper Effect, and Centering Spring and I don’t modify anything else in-game or in files yet. 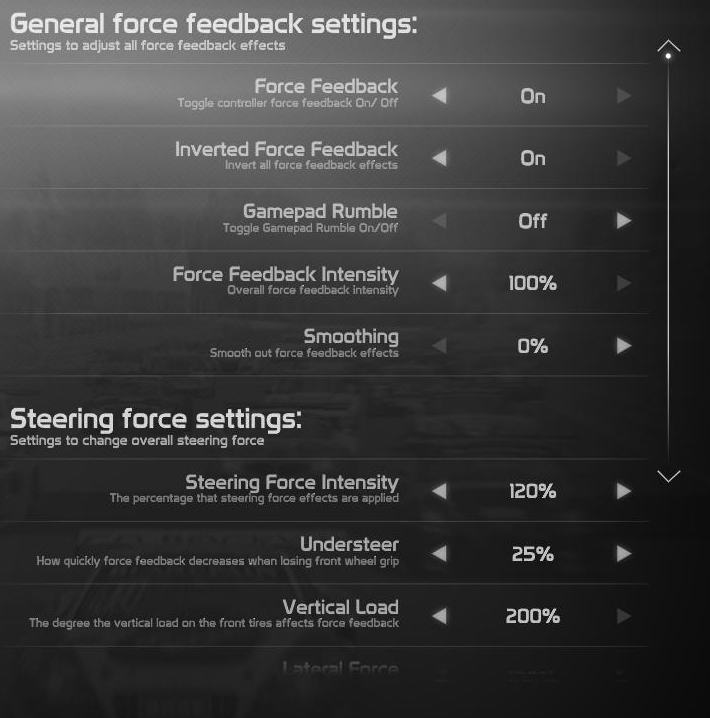 I had these at defaults, due to my assumptions about some his previous posts over at the RaceDepartment.com forums, but I think these are better settings for the G27 now. I think the ffb center deadzone issue is a little bit better like this. I still feel no need to modify any files. My in-game settings are also pretty normal still. I think this is a net win so it’s worth a try. Update 2015-03-31: Sector 3 released another update today. It will make you reconfigure your controllers (which isn’t such a bad thing since ffb is always being updated, just wish they had saner defaults). Watch out for the need for ‘inverted forces’ that some wheels, like the G27, need. I left pretty much most things at default. Among the changes were “3 new FFB multipliers for spring, damper and friction in FFB settings.” Spring is the one we’re interested in for dealing with the G27 center deadzone issue which still exists. I did a binary search from 0% to 100% to 50% to 25% and ended up at 25%. At each level I tried to determine whether hard cornering was ‘clipping’ (overdriving the wheel motors so no nuanced forces could be felt) and felt that 25% allowed me to feel the road through hard steering but, unfortunately, that means the deadzone is still there. Update 2015-02-13: Sector 3 pushed another release yesterday. I’m using all FFB defaults and finding tweaking isn’t very rewarding in R3E with a G27, unfortunately. Center deadzone is still there. Great game, though, and I play it regardless of the FFB troubles. After seeing all the cars, tracks, audio, single player, multiplayer, experiences, championships, hill climbs, etc., I have to say I don’t think any other sim right now comes close to the complete package R3E delivers. Well done, S3! Update 2014-11-18 – 2: Maybe I’m just getting used to the FFB but perhaps there has been a slight improvement in the G27 ffb center deadzone with the latest update although it’s not nearly enough. As well, the AI respect/aggression appears to have been improved. I can occasionally run side-by-side with AI now without getting rubbed off the track and AI are no longer ramming me from behind going into corners so much. Update 2014-11-18: Sector 3 has released another major update today including the DTM Experience 2014 amongst various other improvements. Once again I’ve deleted my controller profile in-game to ensure I’ve got their latest controller changes in and I’ve reapplied my changes. Surprisingly I don’t yet feel a need to change any of my profiler or in-game settings that I had with the previous October update. This is unfortunate as it means Sector 3 didn’t address G27 ffb center deadzone issues. They also haven’t improved AI respect/aggression which I was hoping for. That’s not to say this isn’t a great addition, though, as they’ve made a tonne of improvements to track and cars and released new content all besides DTM-E 2014. There’s even a free real-world track now for RaceRoom drivers: Portimao. Keep up the good work S3! Update 2014-10-18 – 2: I’ve updated my ffb settings for the game update released on 2014-10-17. I started a new controller profile in-game. This resets the controller RCS file and apparently the latest update came with some significant changes that caused all my settings to act strange so I’ve redone everything. The good news is I’m not editing the RCS file anymore. All my changes are in the Logitech Profiler and in-game. Update 2014-09-22: I’ve been experimenting again trying to get as much information of the wheel as possible even in ‘high force’ situations like hard cornering where the force output from the game is much more than the wheel can handle and ultimately drowns out the fine detail. My new Controller RCS file (see below) settings are: FFB steer update thresh=”0.0015″ (1/10th the original; not really sure if this actually helps). In-game settings: Vertical Load: 160%; Lateral Force: 160%. Some cars with heavier steering (Eg. BMW Z4 GT3) still max out the forces by quite a bit and all you get a simple, strong linear steering force. Not much use when you need to feel your way around a corner. If you’re experimenting on your own try to see, during the apex of sharp corners, if you can feel subtle tire force variations. If you can highlight those forces then you’re providing yourself with information about the contouring of the road, understeer and oversteer, etc. All things you need to know to tell how your car is handling. Right now it’s still unsatisfactory but it’s better than it was. Update 2014-09-20 – 2: I compared brake sensitivity with iRacing. For linear brake springs iRacing uses a default 1.8 brake factor (~25% at half way brake travel) and this roughly equates to 0% in SimBin/S3 titles. I’m used to iRacing brakes on a linear spring so I setup mine in R3E at 0%. FFB steer force grip weight=”0.8″; FFB steer force front grip exponent=”8.0″; FFB steer force rear grip exponent=”2.0″; FFB steer load multiplier=”1.85″; FFB steer lateral multiplier=”1.1″; FFB steer rack factor=”0.55″. It works quite well and I can finally feel cornering forces although the ffb gets drowned out around most serious corners. The really drastic change is that 8.8 for “front grip exponent”. By default it’s 0.25 so it must really be helping. My only real problem is that this reintroduces the G27 ffb center deadzone issue as not enough forces are applied to keep the wheel fully centered. This means your Vertical Load setting is largely nullified on straights. Another poster recommends upping your Logitech Profiler Overall Effects Strength to 107%. It’s worth a try. I tried it. It drowned out other ffb effects. Update 2014-09-17 – 3: I have been reading through the FFB Guide mentioned below. While steps are provided to go from baseline force feedback and gradually tune in more and different forces, which all sounds great, sadly the very first steps are what I still feel is lacking in R3E’s force feedback on the G27. 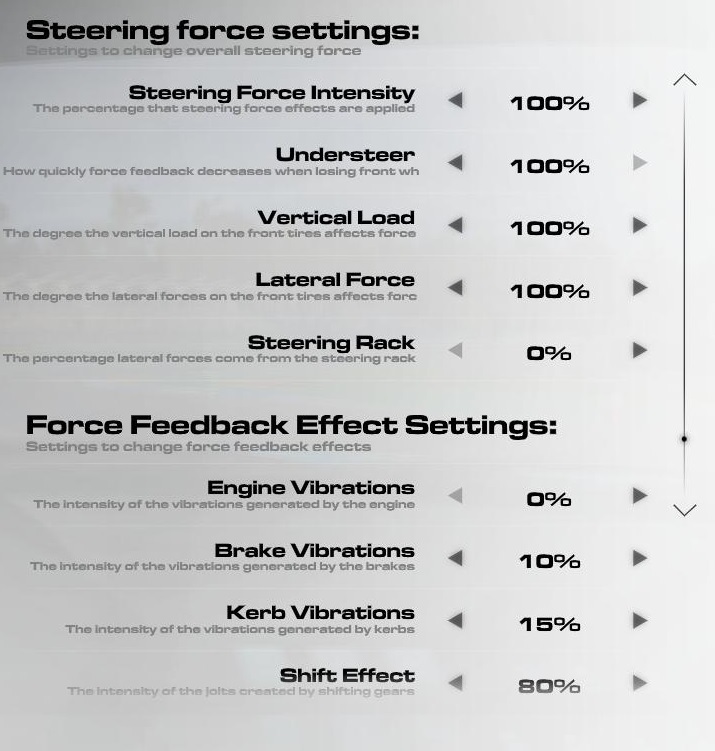 It feels as though too much force is being applied to the wheel during ‘heavy’ steering / maneuvers and there’s no forces left to play with for other effects such as vertical load, lateral forces, understeer, even shift effect. Maybe S3 will fix it but, unfortunately, they don’t really have a track record of delivering on those kinds of things. Still, one can always hope! Update 2014-09-17 – 2: My latest setttings (only where different from what’s posted below): Logitech Profiler: Use Special Game Settings: Checked; Allow Game to Adjust Settings: Unchecked. In-Game: Shift Effect: 80%. 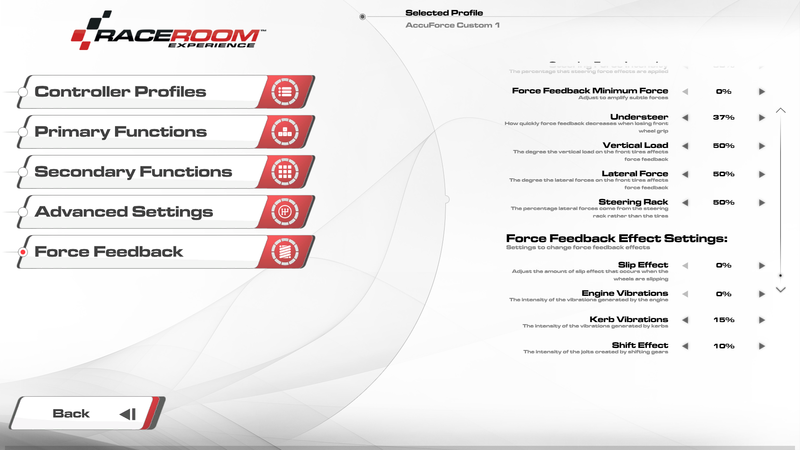 Update 2014-09-17: To disable Brake Vibration while S3 fixes the bug about that not being able to be changed in game edit your Documents\My Games\SimBin\RaceRoom Racing Experience\UserData\ControlSet\Logitech G27 Paddle Shift Custom.rcs file (your file name might not be the same) and set: FFB brake vibe freq mult=”0.0″ // Scales actual brake rotational frequency to force feedback vibration frequency. The default is 6.0. Make a backup of your file so you can recover when S3 actually fixes the bug. Note you may still experience similar ffb braking into certain corners but I’m pretty sure that disabled the brake vibe for me. 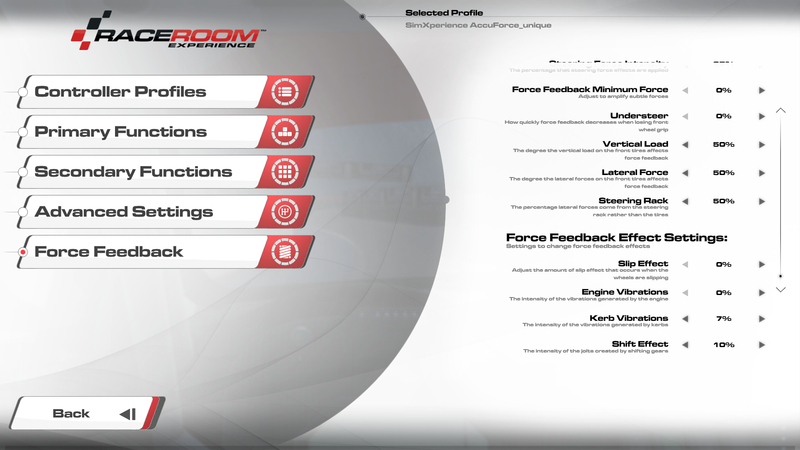 Sector 3 Studios (formerly SimBin) have recently released an update to their sim racer RaceRoom Racing Experience which includes, among other things, much improved feedback. I wrote a post over at RaceDepartment.com detailing my Logitech G27 setup, thus far, for what I feel is giving me the most information out the wheel that I can get right now. That post wasn’t stickied so I’ll reproduce it here in case it gets lost. I hope to update this post in the future as Sector 3 updates their game and I test out new force feedback settings. My primary force feedback goal is more information even at the cost of force strength. It’s amazing how much information iRacing has been able to squeeze into a G27. That’s my gold standard right now. Also, in another RaceDeparment.com thread a forum member reminded us of an old FFB Guide (backup link) for SimBin titles based on, what I believe is, the underpinning rFactor force feedback configuration file settings including detail on how to use them – something that’s really missing in the actual configuration files. I’m not sure how old it is but since rFactor is still at heart of Sector 3’s RaceRoom Racing Experience it should still be valuable. I’ll start with the best setup from my testing so far. Please post your own setups, too. I should note the majority of my testing was with the 134 Judd V8 at Hockenheim. I just tried the same settings with a BMW Z4 GT3 at Red Bull Ring and it felt even better I think. – Matches my profile for iRacing except for “Allow Game to Adjust Settings” which should probably be disabled but I forgot. – I will raise overall strength to 120% when S3 fixes the Brake Vibration bug noted below but right now if I raise the strength the Brake Vibration becomes aggravating. – Smoothing: I’ve never felt a need for smoothing on my G27 except for when raising the profiler overall strength and being unable to change the brake vibration. Smoothing/damping delays/messes with the sharpness of the your ffb which you generally want to avoid. – Steering Force Intensity is 120% to help reduce the G27 ffb center deadzone. Still not perfect. Game needs an iRacing-like Min Force to solve it. – Understeer: Might be lower than some people expect because it doesn’t actually do what I expect although it is a little helpful. – Vertical Load: 200% to let me feel the “3d bumps” in all their glory :) Road feel helps you feel your way around a track, giving you more information about where you are at any given point aside from visuals, etc. – Lateral Force: I like this but increasing it seems to drown out other non-steer forces like Vertical Load. It seems you have to keep a careful balance on each of these settings or they end up consuming forces away from other ffb settings. – Steering Rack: 0% because I never could get the feel of this. – Engine Vibration: It’s a buzzing/vibration coming through the wheel. Pretty useless on a G27. Maybe it works better on others. – Brake Vibrations: 20%. It’s a bug that even if you change it it won’t stick. Will wait for a bug fix to tweak this more, almost certainly will tweak lower with a higher overall strength in the profiler. – Shift Effect: 0% until I figure out the other ffb. Nice effect, though. disable damper and springs in your drivers! *540 degrees with steering lock 23 (or similar) works as well of course. 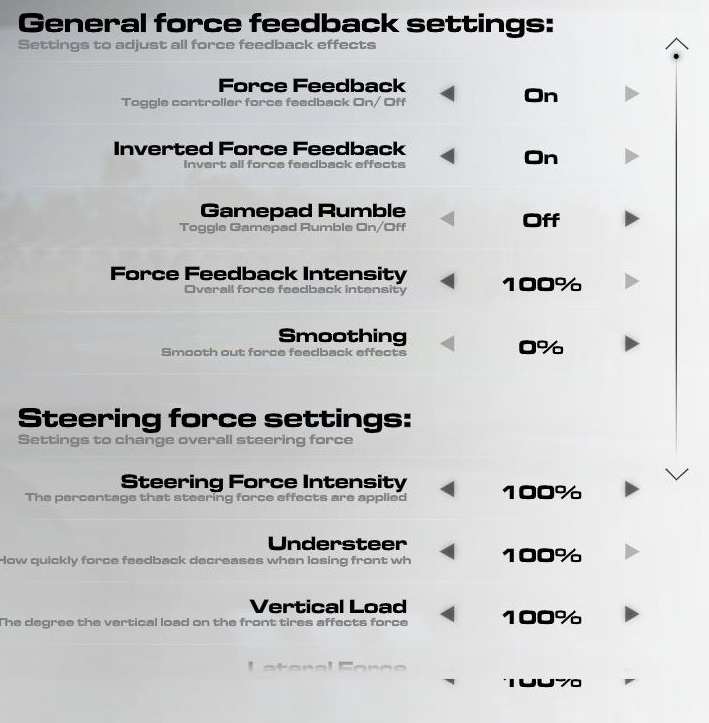 If you are driving a RWD car, then you might want to lower the lateral forces in the ffb menu a bit, and increase steering force + vertical load instead. Once you will get to drive the FWD cars you will see though, why the default profiles have some lateral forces in there. If you are not bothered by your wheel making a bit of noise (Logitech wheels in particular) then go ahead and set the smoothing to 0. If you want to increase the feeling for oversteer etc. increase the steering force. If you want to get more feedback from the road surface increase vertical load. – I found removing my whole R3E folder (ie. my profile) in Documents\My Games\SimBin\RaceRoom Racing Experience provided me a better FFB experience out of the box. *But* I still put in a lot of time dialing in the ffb. – My ffb tastes are for greater information from the wheel at the cost of force strength. I want to feel the nuances of driving and cornering over brute strength. – Try turning down your engine volume while turning up your scrub/skid volume. A lot of the immersion of ffb comes from sound and since the G27 doesn’t have good ffb cornering you’ll need to hear your tires more to compensate. – Different cars need different FFB setups (but we don’t have this option): After testing extensively with the 134 Judd V8 on Hockenheim I tried the BMW Z4 GT3 and noticed I was no longer getting ‘road feel’ (ie. “3d bumps” via Vertical Load). I believe this is due to the Judd having lighter steering, thus using up less wheel force, than the BMW with its heavier steering and apparently almost all wheel force going to steering forces with none left over for other types of forces. – Brake Vibrations can’t be changed no matter what you do. – Can’t disable force feedback / wheel centering no matter what you do (I got it to go completely off (wheel was slack) once but I’ve never been able to get it back no matter what I do. This constant ‘background wheel centering force’ may be throwing off all of our ffb testing. Once S3 fixes it we’ll have to go back and test ffb again. 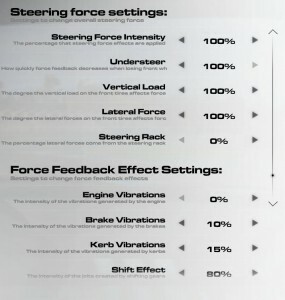 – Kerb Effects: anything above 0% is too much for the G27. There should be a way to get a more graceful kerb ffb effect. This setting does not appear to apply to 3D kerbs only the flat ones. Whatever the effect is it’s too strong for the G27. Apparently smoothing helps. 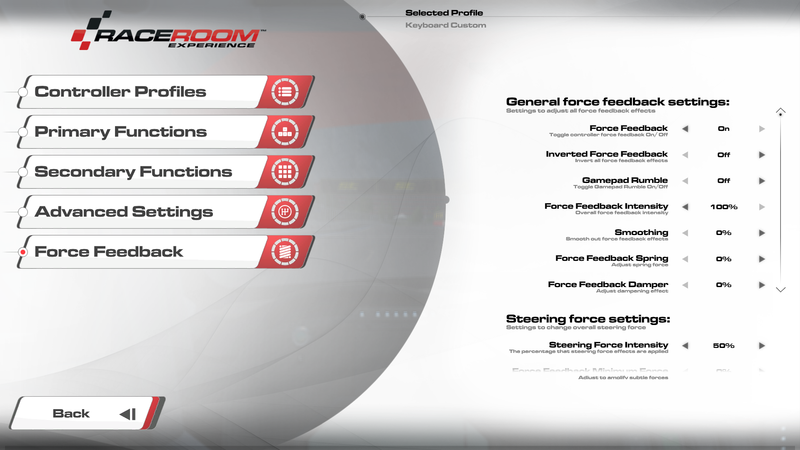 Force meter like iRacing to better determine when we’re clipping force feedback. I need this to ensure that max corner forces don’t exceed the limit of my wheel. Consider prioritizing updates to track ffb meshes and car physics/ffb whenever new content improves these areas. This will help impress new users who only have the free content. As it stands, I’ve been racing the RaceRoom Raceway and some free cars like the Canhard and while they feel alright they don’t feel as good as some of the newer tracks and cars with updates physics/ffb. It would create a little bit more of a competitive atmosphere on the leaderboards if you were notified when somebody beat your time. I think it’d be cool to get some rivalries going with a little back and forth for spots. Auto AI should preferably update every lap through practice and qualification. You’re going to be bad at a new track but after every lap you get better. To provide a decent racing experience, the Auto AI level should keep up to your current abilities. As I understand it, you have to do a full race to get the Auto AI set and then do the real race (ie. DTM 2014 Championship) to use the Auto AI level. It just doesn’t make sense. I’m running so many laps in practice and qualifying they should update then. In a DTM 2014 championship I can’t change the AI level once I start the championship. My problem right now is that I’m so far ahead of them and I want to increase the AI level but it won’t let me. I basically have to throw away championship run. Users should be able to create controller support files for officially unsupported wheels. As the owner of an AccuForce, I’ve been frustrated for the last year that R3E hasn’t officially supported the wheel. The main problem is R3E has no idea how much rotation the wheel has. That means most cars feel like steering like buses. I have to set the wheel lock to 30 in each car to get just a basic sense that it’s right – but it’s still not right as different cars have different ratios and locks. I would love to have the option to create a controller support file to plug in the numbers for the unsupported wheel and have the game automatically “know” about the wheel just like it was a supported wheel. This level of customization could help your users help you by creating a little bit of a customization and modding scene where it’s needed. 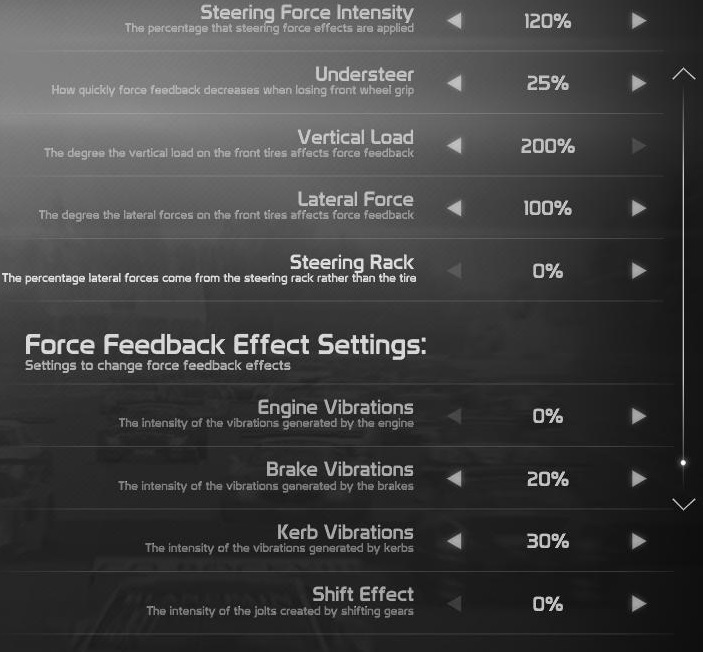 You should be able to get to the in-race menu so you can tweak car setup, wheel rotation, ffb settings, etc. How else are you to know if you can tune in a car properly? The RaceRoom track may not be the best option for all car types. Is the RaceRoom track the best track to figure out if the Formula cars are going to work for you? RaceRoom track road feel should be updated if you’re going to keep using it for testing. On the straight under the bridge there is absolutely no road feel in a Formula car. I would expect to be feeling quite a bit of jostle in the wheel going at top speed down any stretch. 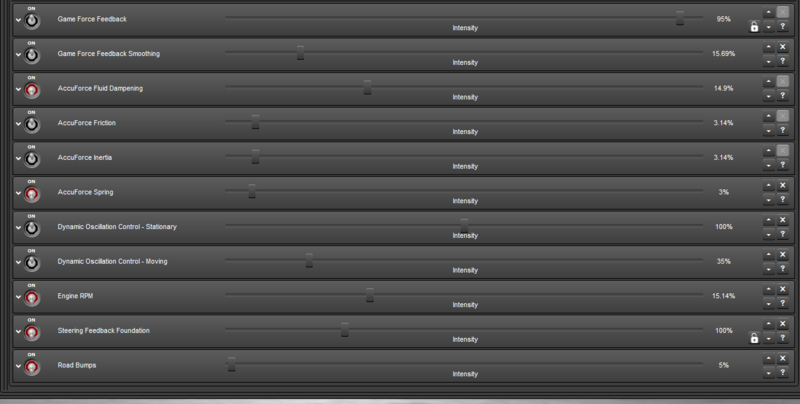 Would be nice if you indicated how much time you have and how much is left while testing. My first test the ESC key wouldn’t work and I had no idea how much time I had left or how even to exit the sim. I was just lucky the session finally timed out and it booted me out. Consider using laps completed as a session limit rather than time. For example, if I don’t know a track it might take me a few laps before I stop making mistakes and start having clean laps at which point it’s nice to get in at least 3 clean laps or more to decide if the car is going to work for me. Buy all remaining content: It would be nice to have a feature in the store where we could buy all remaining content. It’s easy to get all the cars and tracks but very tedious to purchase all the liveries. I should be able to seamlessly switch between paddles and h-shifter while driving (barring issues like manual clutch vs auto-clutch). As it stands you have to go into a deeper menu if you wish to switch. Improved Direct Drive wheel support. I’ve moved from a G27 to an AccuForce and it’s quite difficult to nail down something that feels right because it’s giving so much more info than other wheels. Some leaderboard tracks (eg. RaceRoom Hill Climb) go into RaceRoom mode whereas other tracks do not. When you press Escape while driving you get a different menu and you can’t go back to the leaderboard easily. It also appears that, when this happens, your leaderboard scores don’t get refreshed immediately on completing the track. 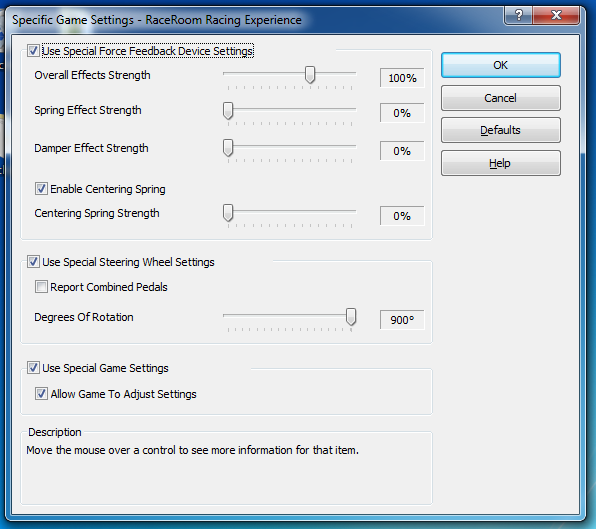 Pingback: iRacing Force Feedback Settings | Selah. great info here – the 200% fixed all my issues. Never would have thought to try that. Now this game is the tops of my sim list . Feels even better than iracing or AC now. Thanks for this info!! Glad it helped! It’s a great game and definitely the ffb on some wheels feels really, really good. Enjoy! There is no post from Georg Ortner in the thread you link to. I get really mad with sector3 for constantly butchering their forum posts. Thanks for the heads up. Check the update from 2015-04-15 for the new link. I meant that link from 2015-04-15. Theres no post from georg in that thread. S3 must have screwed up. Ugh, right. I updated to highlight what he had said. Hope it helps. Ah thanks for that I’ve added the link as an update. 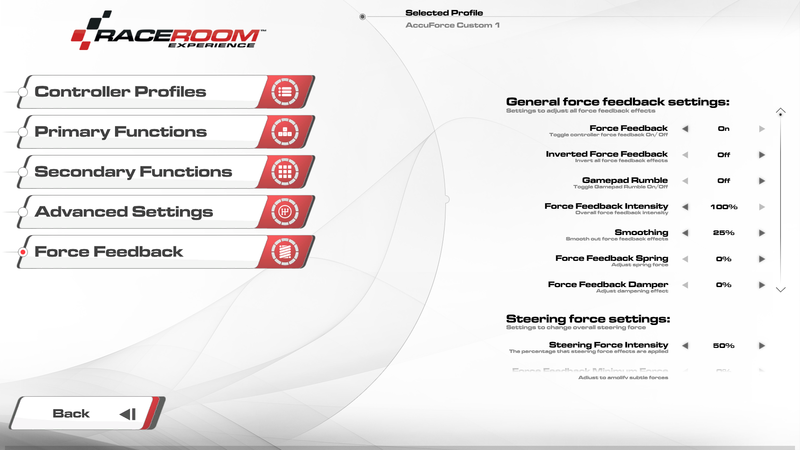 Pingback: SimXperience AccuForce Pro Steering System – Selah.